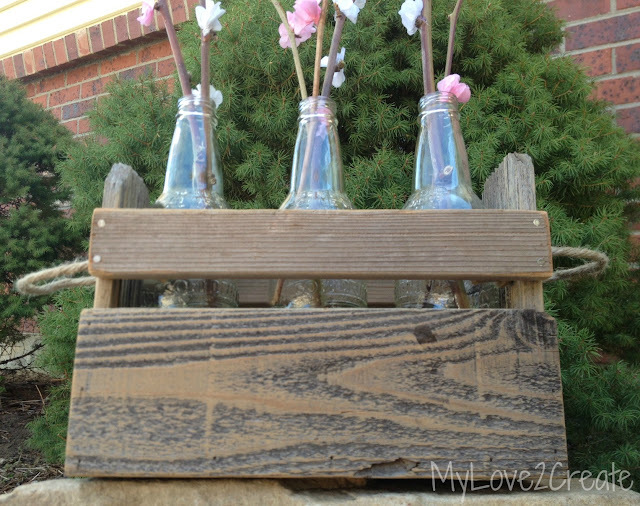 I am obsessed with crates, or any fun container made from wood, I just can't get enough of them!!! So when I had my nail gun and air compressor out last week I decided to make some. 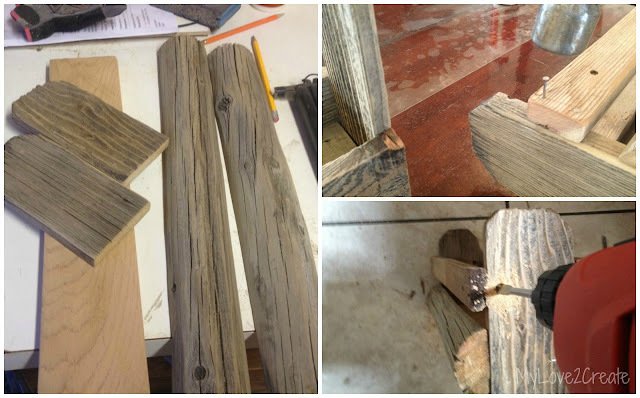 I have a stash of old fence wood and had been wanting to use the top end pieces of the fence so that is what I designed them around. I started by getting a bottom and cutting two sides the same length (left). Then I took my end pieces and glued and nailed them to the bottom (right). Next I glued and nailed on the sides. For the longer crate I had this really cool rounded log fence wood from my in-laws. I first made the three crates without the top bar, but I didn't like them so much. And of course I had already drained my air compressor....ugh. So I did things the old fashioned way (top right photo) and used glue and good old hammer and nails to add some top rails. They were so fun and quick to make, I promptly gave the two small ones away as gifts to special people, and I still have the longer one. 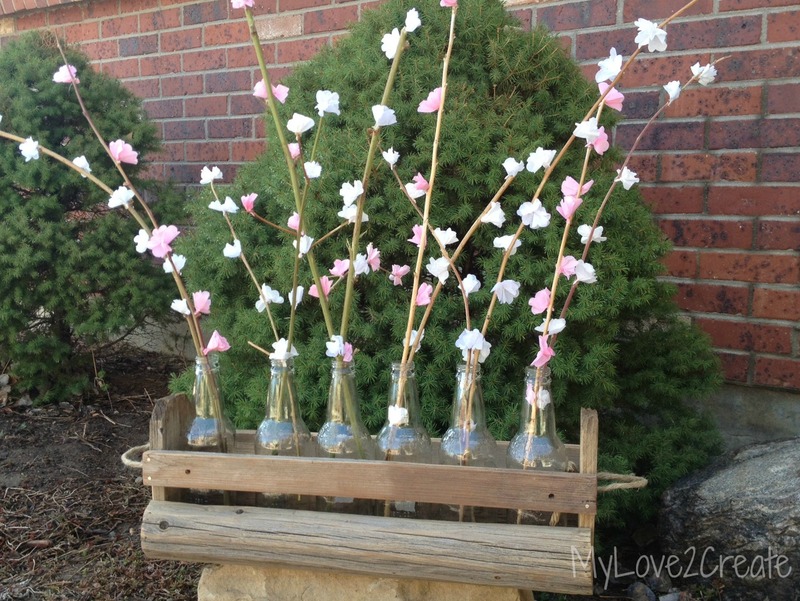 I know you have seen me use those cream soda bottles before Here. These crates also fit the small size mason jars, or you could use tin cans (you know, like from green beans, or any beans for that matter). And maybe some of you recognize the cute blossoms from Posed Perfection. Some friends and I made a bunch for an activity I was in charge of, they made beautiful center pieces. After the event we all took some home and I have been really enjoying them! 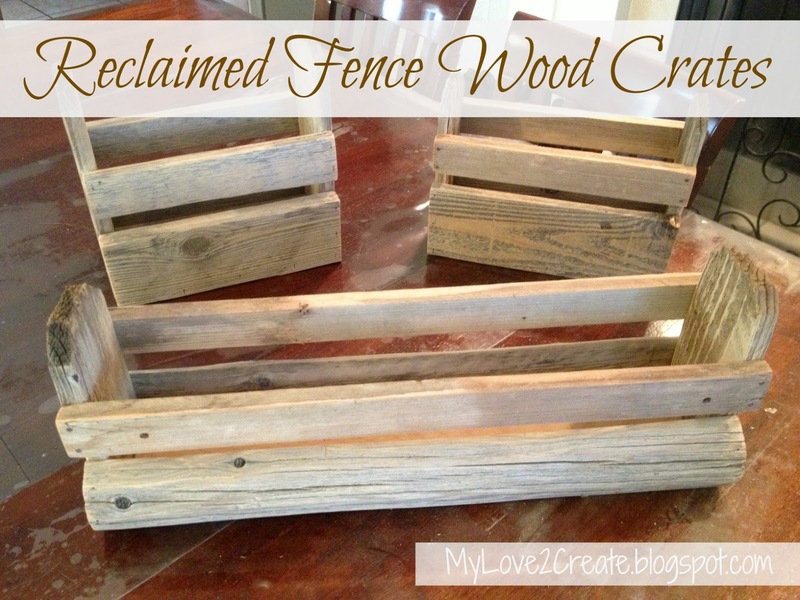 So if you get the craving for a cute easy crate, keep your eyes peeled for old fence wood! I get mine from the free section of Craig's list, for you Utah people check the free section on KSL. They are popping up all the time! They make great gifts....Ahhhh! 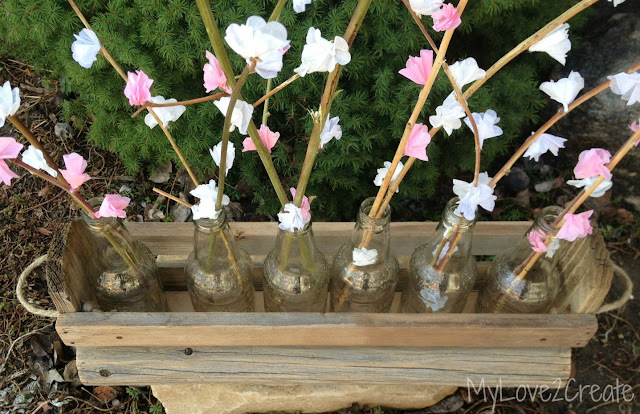 That just made me think.....oooohhh I am totally going to do these crates for teacher gifts this year! Wow, you just witnessed some inspiration! Sa-weet! They can hold anything which is what is so fun about crates....ah...I am in love! I hope your days are filled with springy warm weather and singing birds! It is SO nice to finally have that in Colorado! Dropping by from Diana Rambles. Cool project, I +'d it. I think you are becoming the queen of reclaimed wood, and that's a good thing. Love the project so much! Pinned it of course! oh...and I don't know what movie that sentence is from. You're gonna have to tell us, because I am not gonna be able to sleep until I know. Ok, I will tell you. It is from "You've Got Mail" You should watch it! They are fantastic!!! I really like them with the bottles!!! Just so super cool!!! Another score!!!! 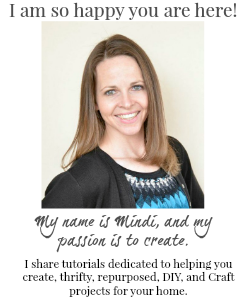 I can understand your obsession, Mindi! They are fairly easy to make, kind of free and the end result is totally cute! I love the blossoms too! Adorable! Thanks for sharing your tutorial. Pinned! What a great tutorial, and it looks fantastic!!! Lucky special friends and teachers! Very creative use of the rounded fence posts. Love how you styled them. Visiting from suburbs mama. I'm obsessed with any kind od reclaimed wood right now. Love these crates, so rustic and cool. Love your crates! Visiting from Maria's link party. Brilliant! I came over from 36th Ave and just LOVE your crates!!!! I love these, the stain brings out the grain. What movie from the quote? I don't think I saw it? I love how they hold those soda bottles with the flowers. A happy bit of spring! What a great job, I love the crates. 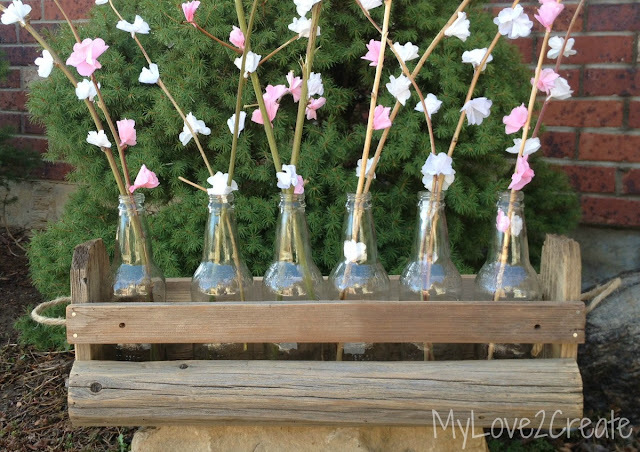 You are so talented and I like how the bottles hold the pretty flowers. Thanks for sharing. I am a new follower. 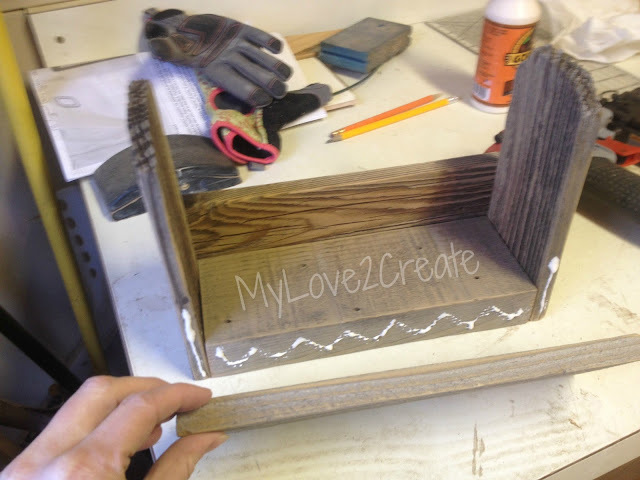 Great ideas, we have tons of extra wood laying around; Can't wait to show my husband for inspiration! You are a Featured Favorite this week on Cheerios and Lattes! We love having you join us and can't wait to see what you've been up to this week! Your crates are so cute! 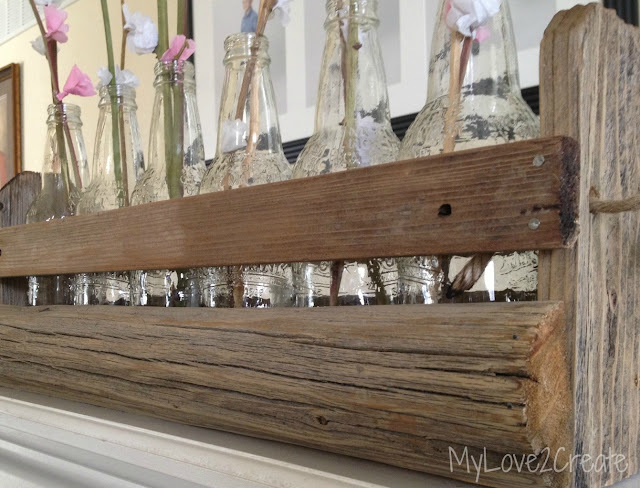 Great way to recycle the fence posts! 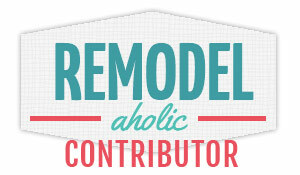 Thank you for sharing it at to What We Accomplished Wednesdays. Have a lovely week! These are so darn cute...so I just had to feature them at my party today. I love them! 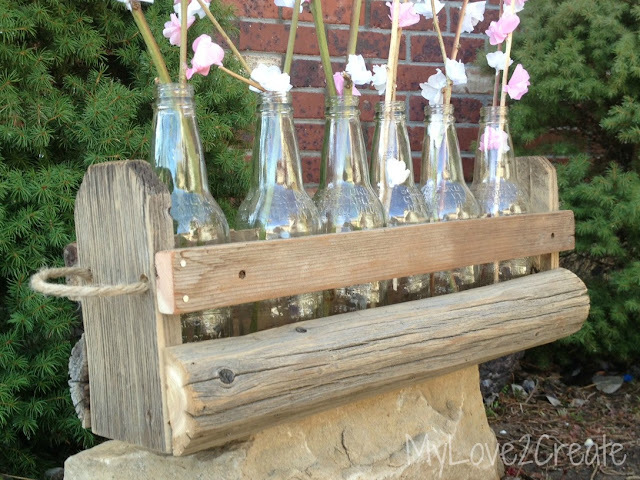 Great use for the old fence panels! Pinning! you know I love crates, and old fence! These are so cute... I have never sold a single one. and I think it's cause I don't "stage" them so cute! :( I hope to take some to my upcoming show... need to stage them for brides. thoughts? Ah a girl after me heart, love crates of any kind. What there is about them I don't know but they're so darned cute and handy. Yours are so great, I had to print your tutorial out, great one by the way. I saw a couple more crates on the You might also like" so I'll go into those also. Yes boss, how so sweet your blog is! Really,your post is very very nice. I liked that. I pleased to clearly. You know of course,there have also information about using an air compressor. If you want to see its then Visit Here. Thanks a lot for you.